While the company name of Pioneer, Japanese consumer electronics manufacturer might be less known here in the United States, their contributions to the electronic entertainment world have shaped and changed the industry forever. Like their name boasts, they truly are a pioneer in the industry, often coming up with new electronic devices before any other brand has a chance. In 1962, Pioneer introduced us to the world's first separate stereo system. In 1975 they gave us the very first component car stereo. They brought the first 2-way addressable Cable TV system in 1977, in '79 and '80 they were one of the forerunners for LaserDisc Players and in 1984 they developed the first machine to play both LaserDiscs AND CDs. Also in 1984 the world's first ever car CD player was brought about by Pioneer. They produced the world's first CD that is based GPS unit in 1990, the first ever 4X CD-Rom car changer in 1992, the first DVD/CD/LD player in 1996, and the first very DVD based GPS in 1997. They're also the masterminds behind the world's first DVD-R drive, the first OEL-equipped car audio product, the first 50-inch HD plasma screen TV, the first DVD-RW recorder, the first DVD player for professional DJ's and VJ's, and in 2008 they developed a 16-layer BlueRay Disc that can store 400GB. 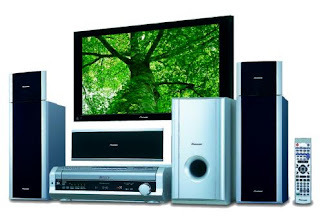 With all these great devices, it's only natural that many people are after Pioneer home theater systems. Being the leader in DVD, Blue Ray, and HDTV technology, it's no wonder that Pioneer home theater systems are some of the most innovative and powerful home theater systems on the market today. Coming in a variety of colors and wattage, along with Pioneer's highest quality High Definition TVs and 5.1 surround sound speaker system makes Pioneer stand out as a high quality and innovative home theater brand name. And with prices starting in the low $200 price range, Pioneer's home theater equipment is one of the most affordable and consumer friendly systems around. While Pioneer home theater systems are popular and in demand, they won't be around for a whole lot longer. On February 12, 2009, Pioneer made the public announcement that it will be discontinuing its line of television sets by March of 2010. So if you haven't done so already, you should get your home theater system from the most innovative electronics brand around before your opportunity to do so is gone, and you only have a year or less to do so.